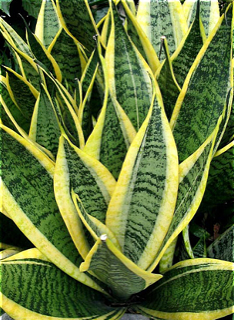 There are about 60 species of Sansevieria, but since many of the species are variable and have widespread habitats, there are more names than this. 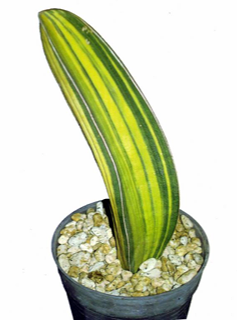 There are also dozens of cultivars, particularly of variegated Sansevieria. They are currently in the Dracenaceae family, but have moved through the ‘dumping ground’ families. In older references, they will be found in the Lilaceae, Aloinaceae, Agavaceae, and other families. 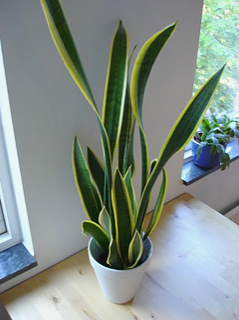 Most Sansevieria are native to Africa, although some come from India, Asia and the South Sea Islands. 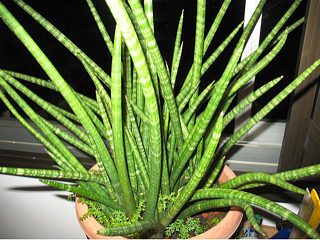 They are among the easiest of all succulent plants to grow, requiring only a pot or a spot in the ground. 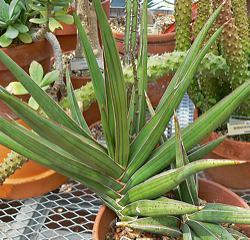 They are tolerant of incredible neglect and abuse, but most grow rapidly and well if watered and fertilized regularly. 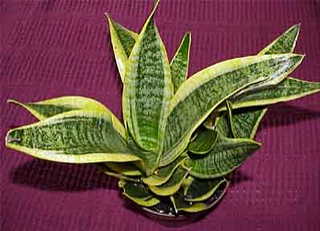 They do well in Southern California outdoors or in, and suffer damage only if they are cold and wet. They are free from most pests, suffering only rarely from scale. They are prone to fungal rusts, particularly in damp weather. The only cure for rust is to cut off the infected leaves, sterilizing the cutting tool after each cut (an alcohol wipe will do) and then spray the entire plant with a fungicide such as Funginex. Prevention is much easier. Bright light, and moving air prevent most rusts. 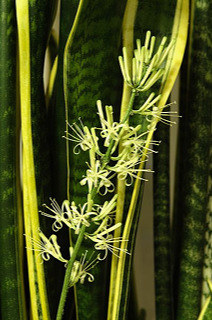 Sansevieria propagation is remarkably easy. Cut a piece off, let it dry for a few days, and stick it in some potting soil. 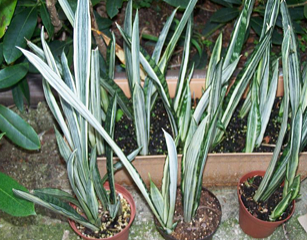 They propagate readily from leaves (tips are best), rhizomes, roots, etc..
Variegation is very common in cultivated Sansevieria, and variegated plants form the majority of some collections. 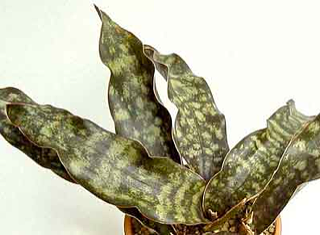 A variegated pup will appear on an otherwise normal plant. 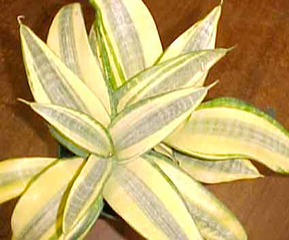 The variegation can be preserved by removing the pup and a portion of the rhizome, and growing it on. 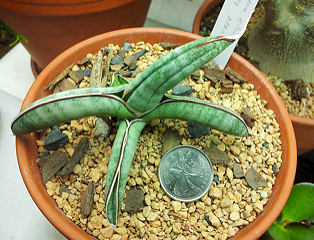 If this is not done, the variegated pup, being weaker than the rest of the plant will not reproduce. 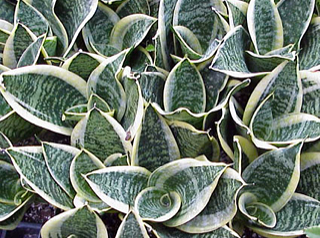 Variegated plants are slower growers than normal plants, and are much more sensitive to cold and wet conditions. They need protection, particularly in the winter. They are also sensitive to standing water in their crowns, quickly rotting it water is allowed to remain. Named for Christian Gottfried Ehrenberg, 19th century German naturalist. 1. Named for Harvey Monroe Hall, 20th century American professor of botany and expert in taxonomy, or George Rogers Hall, 19th century American medical man. 2. Named for Herman Christin van Hall, 19th century Dutch botanist, or Elihu Hall, 19th century American surveyor. Named for Kirk; the person commemorated depends on the specific epithet. Named for Prince Raimond de Sansgrio de Sanseviero, 18th century patron of botanical expeditions.